In recent years there has been a big push towards creating many more green buildings across the world. From 20,000 new homes being green building certified in New Zealand in 2017, to Canada possessing over one billion square feet of LEED-registered space (Leadership in Energy and Environmental Design), focusing on eco-friendly design is more important than ever. If you’re creating a new building, whether a home, office or even just a garage, then there are many things to consider for making it eco-friendly. The world creates 1.3 billion tons of rubbish each year, which is an incredible amount, and in order to reduce this, a good step can be to use recycled materials in construction. Rather than going straight into a landfill, a lot of materials can be used in buildings. For example, recycled cork panels make for great flooring and provide an extra level of insulation. Then there are recycled glass tiles which can add a nice finish to any work or home bathroom, while recycled steel has a wide range of purposes. 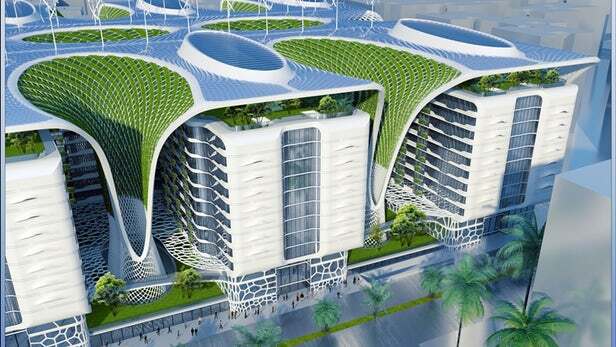 A plethora of green building technologies is providing excellent tools for creating eco-friendly buildings. To help lower heating costs, technologies such as ultraviolet light and photo-reactive chemicals are being used to improve air purification, reusing large amounts of internal air. LED applications are popular for energy efficient lighting, while there are many more self-powered buildings popping up with the likes of wind turbines stuck on top. Wile wind turbines offer many benefits, a more common choice which should be considered is adding solar panels onto any new building’s roof. Of course, the positioning of the building will have an effect, as most advice claims that it’s best for the panels to face south. Plus, if your new building is overshadowed by other, much taller ones that block out a lot of the sun then it can seem like a pointless expense. Poor insulation means you will end up using a lot more energy than necessary to heat the building. Installing insultion after a building has been constructed can be a costly and far less efficient job, which is why doing so in the building and planning stage is important. The types of insulation available range from simple double-glazed windows to cavity wall insulation. It’s essential you focus on insulation that keeps buildings cool in summer too, especially if located in a hot location, to reduce the energy usage of air conditioning as well as heating systems. GVA Worldwide can help when expanding to overseas, warm locations. The placement of all windows in your building will have a significant impact on energy in two ways. Firstly, if they allow in plenty of natural light then you can spend less on lighting bills. Secondly, they can help when it comes to heat, with the likes of skylights allowing more light and heat energy to shine through. They can also help when it comes to keeping cool in summer as well. Focus on green design when planning your next building.